Thanks to the release of Steam for Linux and the announcement of Steam OS, the number of games available for Linux have been going up systematically. Valve is also preaching by example and porting many of their games to Linux, perhaps the most exciting of all is Portal 2. One of the best games ever made. Netrunner comes with Steam ready to install so, if you’re curious, the growing world of Linux gaming is only a couple of clicks away. One of the characteristics of the modern gaming industry is big studios mostly redo the same games over and over again, adding or changing only a minor set of features. It’s not that these studios lack talent (proof: the game we’re about to review is from an ex-developer at Naughty Dog), they just can’t afford to take risks with multimillionaire development enterprises. Failing is too costly and success requires a ludicrous amount of revenue. Add the corporate nuisances that come with such big companies and you have a recipe for conservative development. Given the circumstances it shouldn’t come as a surprise that most of the exciting original games are coming from the keyboards of very small studious or even from a single independent developer. While the coming of triple AAA games is important for Linux as a gaming platform, and a lot of progress is being done in this front, the coming of indie games to Linux is not less exciting. 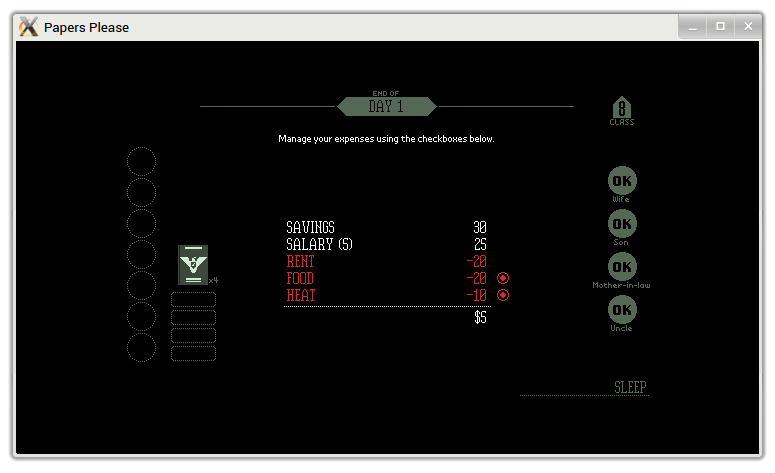 Released on February 14 for Linux, is one of the biggest examples of a game a big studio would never even dare to write on a whiteboard: A bureaucracy simulator set in a dystopian future. Perhaps, if you were unaware of its existence, you’re yourself wondering why would that ever make it to the whiteboard. 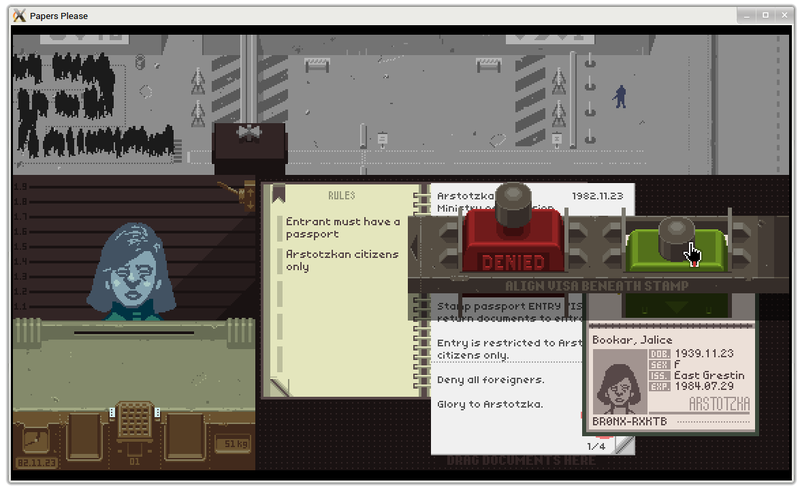 Papers, Please is both a puzzle game and a narration-heavy game. Unlike recent attempts at heavy narration the progress isn’t driven by a series of Quick Time Events (QTEs), i.e. narration is not built by destroying all gameplay mechanics. Instead narration is moved forward and divides into different branches trough a series of puzzles. 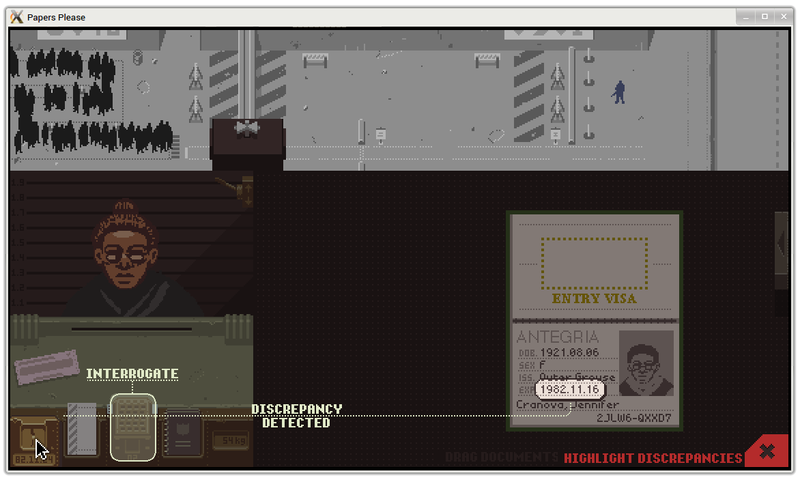 You’re an immigration officer in the frontier of the dystopian country known as Arstotzka. Here you must do what any immigration officer does: Check the documentations provided by people attempting to enter your home nation. All the puzzles consist on verifying if the documents are valid and the declarations by the candidates match their papers. To this end you have a not so simple manual with all the rules, from the mandatory documents for immigrants, to rules regarding specific nationalities, to all sort of information from diplomatic seals to issuer cities. Your job is to find any mismatch between the documents and the rules and the documents and the person’s characteristics and claims. For this end you have a scanner and by selecting two data points you may corroborate the information. If there’s a mismatch you may proceed to interrogate them. At the beginning only a few things need to be checked, as the game moves forward and the political situation worsens the requirements will go up in very interesting ways. The difficulty curve is well designed, neither too fast nor too slow. Another important elements is how you spend your earnings, every three mistakes will cost you. Some people will try to bribe you to do stuff for them and the reward may be considerably higher than the penalty of rejecting or accepting incorrect people. Sometimes you will know somebody is not legit, that their papers are fake, yet all the information will be apparently correct, then you will be forced to choose into accepting a penalty or letting him in. 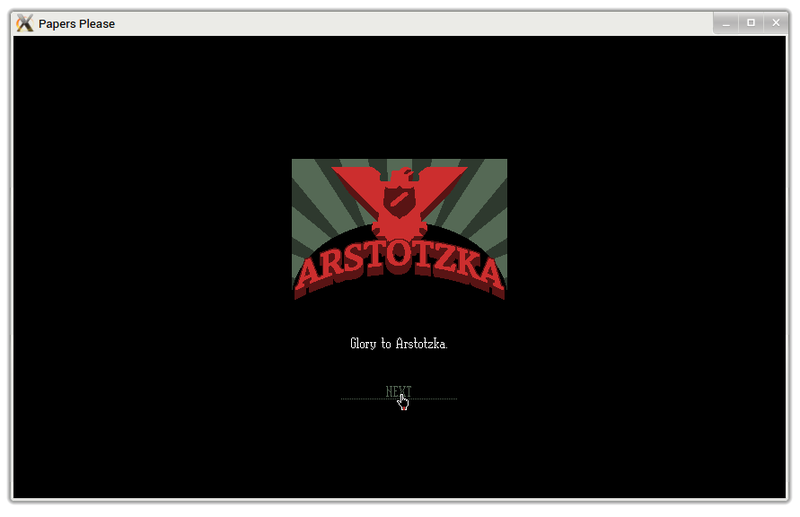 The big story setting is about the internal political struggles in Arstotzka as well as the conflicts with other nations, all of which reflect in your little cubicle in the frontier. Soon you’ll find about an organization which plans to bring down the current government down, your nation will be the continued center of terrorists attacks by another nation, you’ll face interrogations, people will beg you to let them pass, people will bribe you to help them pass, transmit information among them, seize papers and more. All of the big issues are of international scale, but in your house things are different. The story is about the struggles of your family to survive the merciless cold, hunger and illness that plague all common men in Arstotzka, including yourself. I won’t spoil it for you, but there’s 20 different endings. You will be forced to take sides, but following all your orders may end up with your family starving to dead, if you accept bribes an investigator may find out, if you’re against the government your family may pay the price of your contributions to the insurrection. The game constantly puts the player in moral conflict. Whatever the player tries it seems all of decision can end up in mayhem. Yet, you have to choose. Your petty repetitive job has consequences on the lives of many, from broken families to criminal rings to whether someones lives or dies. Your actions may even affect an entire nation, a regular person sitting in a miniature office appears to hold the key to the future of many. Yet, the player still feels powerless in this world, for the one thing your can’t control is your’s and your family’s destiny. They’re suffering and doing the wrong thing may be the only way to save them. Perhaps after playing it you will never again question how some people could stand and do so many atrocities in the name of a state that was clearly wrong. Very few games can claim to be original these days, very few games can portray moral conflict effectively. Papers, Please, however, is not everyone. If you’re looking for a rush of adrenaline this game will disappoint you. If you want something entirely out of the ordinary and don’t mind a slow paced adventure, Papers, Please will probably satisfy you. Its style of presenting conflicting situations through the core gameplay mechanic renders it, to my personal taste, one of the best games of the year, easily up there with the big AAA games of the passed year. The game is available on Steam for $9.99, however I recommend interested readers to buy it from the Humble Bundle store. From the latter is sold DRM-free, some money will go to a charity and it includes a Steam-key. March 20, 2014 in Reviews, Software.